Ron Graham’s body was found on the streets of Toronto. In a sport where memorial races and commemorative awards are the norm, it seems bleakly ironic that a former horseman can die alone and forgotten. But this was the fate that befell Ron Graham, who ended up homeless in Toronto. The Cape Breton-born trainer/driver passed away sometime during the night of October 27, 2018. His body was discovered the next morning, inside the gates of the Osgoode Hall legal building. He was 62. The official record has scant details of Ron Graham’s life. His career in harness racing predates the era of ready digital data availability, although it seems that he played a valuable role behind the scenes, working as a groom and possibly a trainer or assistant trainer at major tracks. Greenwood Raceway ceased racing in 1994; Blue Bonnets/Hippodrome de Montréal followed suit in 2009. Yet Graham’s freefall cannot be attributed to the closure of any one racetrack, nor to the end of Ontario’s Slots at Racetracks Program in 2012. Graham once declined Monteiro’s offer to directly contact any old connections back home, making a different request instead. “When I went to Cape Breton, he told me to bring him a lobster, and I did—and he threw it at me, because it was plastic,” said the Haven administrator, who frequently joked with Ron and considered him a friend. Exchanges with a number of prominent Cape Bretoners in harness racing—including the unrelated Northlands Park trainer/driver Ron Graham, who is happily retired and living in Edmonton—suggest that the late Ron Graham came from a racing family in the Sydney, NS area. “When I arrived in 2010, he was outside, sleeping rough. He was very popular with a lot of our guys who are into gambling, which gradually slowed down after a while,” said Monteiro. Fewer clients with connections to the tracks come through the doors at Haven now, he adds, pointing out that people in any profession can find themselves on the streets due to many varieties of personal misfortune. Monteiro said Graham refused to use homeless shelters. “Ron hated those places because they are very unsafe and older men are victimized there. He wouldn’t go in.” But the alternative was also cruel: “He was sleeping under one of the overpasses and he was robbed. He was so thankful that they stole his cell phone and everything, but they left his medication.” Graham would visit Haven’s Jarvis Street drop-in each day to play cards and share stories of happier times. “He was one of the most humble guys I ever met in my professional career. Outwardly, he was very tough and streetwise. I sort of gravitated to him for a whole lot of reasons. I thought, ‘Let me keep an eye on him,’” said Monteiro. But far from being a troublemaker, Graham revealed himself to be a quiet helper to those worse off than himself. In the days before his death, staff at Haven noticed that Graham wasn’t himself. Monteiro said Graham refused to be taken to hospital, and may or may not have sought medical attention on his own. As always, he turned down offers to help get in touch with his family. There was no obituary written for Ron Graham—in fact, this article was written in an attempt to gather enough information about his life to make an obituary possible. Graham’s passing was marked in December, at the Church of the Holy Trinity’s monthly memorial service for Toronto’s most recently deceased homeless people. It seems tragic that a man with such pride in his harness racing career would disappear into the shame of his situation, erasing his presence among those who could have helped. 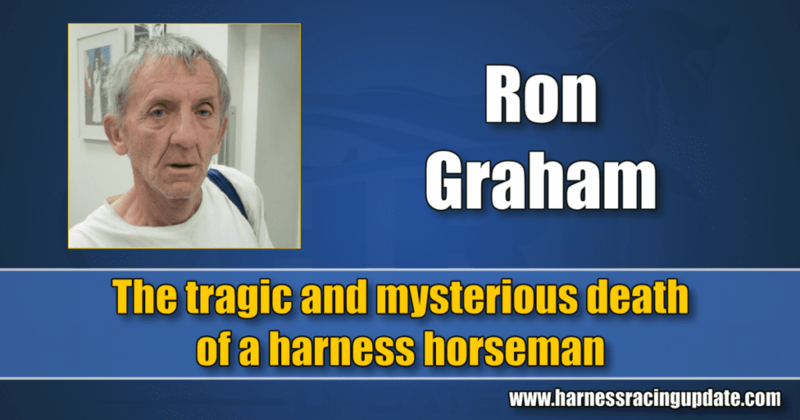 It also seems that learning more about what happened to Ron Graham might help protect other retired horsepeople from a similar fate. While he avoided the spotlight, it sounds like what he would have wanted. If you remember Ron, feel free to contact Lauro Monteiro at Haven Toronto: (416) 366-5377, info@haventoronto.ca, or Melissa Keith (mkeith71@gmail.com). Donations in his memory can be made at www.haventoronto.ca.